Rent a cabin or stay with your kids and pet nearby then get on the water in and around Massachusetts. What’s available? An ocean and saltwater bays, fresh water inland lakes, rivers, and ponds, just begging to be explored. Paddle your own canoe, kayak or board. You’ll find parking, wheelchair access, paved and gravel boat ramps, piers and shelters and places to portage in and rent equipment. Friendly instructors offer individual instruction and clinics. Bring your canoe for some smooth paddling around the Upper and Lower Highland Lakes. Ramps are available; day-use fee applies. Please ensure that your boat and equipment are clean. See DAR State Forest for full description of this park. This lake is composed of three large, north-to-south segments. A boat ramp is located on Middle Lake. Boating regulations: Alcohol is prohibited; lifejackets must be worn by canoeists and kayakers from September 15 to May 15; water skiing is allowed on South Lake only; power loading of vessels at ramp is prohibited; boating allowed only during daylight hours; swimming from boats is prohibited; boaters are responsible for their wake; no personal watercraft or ATVs are allowed on or around the lake. The Crane Wildlife Refuge is a patchwork of coastal and island habitats that includes a portion of Castle Neck and seven islands in the Essex River Estuary (Choate, Long, Dean, Dilly, Pine, Patterson, and Round). Surrounding the Crane Wildlife Refuge is the Great Marsh, the largest contiguous salt marsh in New England, covering more than 25,000 acres from Hampton Harbor, NH to Gloucester. The largest of the Refuge's islands, Choate Island, supports abundant wildlife, and during the 18th and 19th centuries, Choate Island and Long Island were connected by a causeway, comprising a prosperous farming community. Use the Pauchaug, Barton Cove, Sunderland, Hatfield, and Chicopee Boat Access points to launch your canoe (find details below). Elwell Recreation Area is designated for canoes and rowing only. Paddle at your own pace up/down the scenic and historic Connecticut River. See full description of Connecticut River Greenway State Park. See boat ramps and river access of Connecticut River Greenway State Park. Located at the southeast abutment to the Berkley-Dighton Bridge, this tiny park is excellent for canoers and kayakers to enter the river (motor boats and boats in tow are prohibited). Also nice for fishing, picnicking, and families. Follow the paved path alongside Westfield River to reach the boat launch area for canoes and kayaks. See Robinson State Park for full description of this park. The fresh water pond in this park is open to paddlers, canoeists, kayakers, and motor boats. See full description of Hampton Ponds State Park. 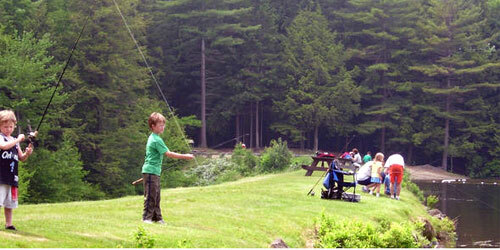 This major recreation area consisting of a lake, the Quinebaug River, and several ponds includes a canoeing trail. See full description of East Brimfield Lake / Holland Pond / Quinebaug River Recreation Area. Part of the Mystic River Reservation, a string of parks along the Mystic River, Mary O’Malley Park has a boat landing, granite pier, and a shelter. Nice views of the Tobin Bridge over the Mystic River. Park also has tennis courts and an open lawn. Hours: Open year-round, dawn to dusk. Launch non-motorized boats only from North Pond's public ramp. Day use fees apply. See Savoy Mountain State Forest for full description of park. From the entrance on Farm Street, boaters can portage to the put-in, or canoes and kayaks on the Charles River can land along the plantation of red pines that lines much of the reservation's frontage on the river. Over two miles of trails traverse woodlands featuring a large, massed planting of Dexter hybrid rhododendrons and an oak and hickory forest, whose trails and understory plantings were laid out by landscape architect Fletcher Steele. Canoe along 18 miles of rivers in this scenic hidden gem. See Mohawk Trail State Forest for full description of park. 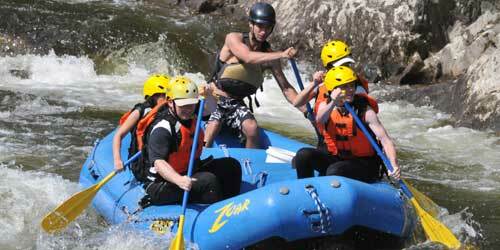 Canoe along the scenic Westfield River East for a fun work-out! Bring lunch for a picnic, too, but anything you take into the park, you must leave with. See C.M. Gardner Park for full description of this park. When the tranquil waters of Lawrence Brook reach Doane's Falls, they tumble in a sequence of dramatic waterfalls. Along the way, large boulders in the streambed, small forested islands, and flat rock slabs divide the fast-rushing stream before it empties into Tully Lake. On the southern bank of Lawrence Brook, just upstream from the falls, is Coddings Meadow, a little-known clearing in the wood that offers views of the quiet waters of Lawrence Brook and is an excellent launch site for exploring the brook by canoe or kayak. Ipswich River runs east-west along the northern border of this park, formerly an estate. A kayak and canoe rental business is located just east of the park, on Ipswich Road. See full description of Bradley Palmer State Park. Paddling, motor boating, and other water sports are done at this state park. A boat ramp and parking is available for boat trailers. Known as the "Gates of the Charles," Rocky Narrows’ canoe landing connects to a two-mile loop trail that follows the river's edge to the Rocky Narrows Overlook. The overlook rewards visitors with views of steep, hemlock-clad rock cliffs that form a narrow river passage - the landmark that gives the reservation its name. Further south along the trail is King Philip's Overlook, named for the Wampanoag chief who warred against the early settlers of the Massachusetts Bay Colony. 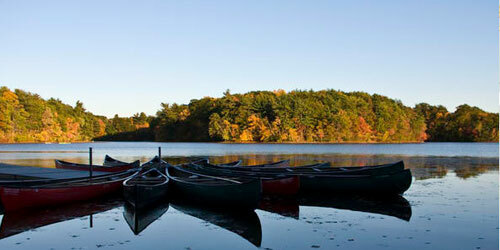 On these twin lakes just a stone’s throw from Boston, sailing programs are offered at the Tufts University Boathouse. Upper Mystic Lake is limited to paddling (canoes, kayaks), only. Power boat owners may use the Lower Mystic Lake. No wakes. This park is in the pine woods of inland Cape Cod. Canoeing and kayaking are done at eight fresh-water kettle ponds, which are glacial formations, fed by rain and underground streams. The park is not located on the shore, but it is an easy walk or bike rides from Nickerson to Cape Cod Bay. See Nickerson State Park listing for full description of the park. Canoe or kayak down Sanderson Brook, Griffith Brook, or the Westfield River. See Chester-Blandford State Forest for full description of this park. Two boat ramps serve this clear mountain lake. Motor boats are limited to 10 hp or less. See full description of Lake Mattawa. Boating on the Merrimack River is permitted at this park, which displays the industrial history of the city of Lowell. Boating access to the river is at the Rourke Brothers State Boat Ramp on Route 113. It has 44 trailer lots and 20 car-top lots. The entrance to the ramp is across from 1011 Pawtucket Blvd. and one-half mile west of the Rourke Bridge. There is a public motorized boat launch ramp along Otis Reservoir. Be aware of swimmers and fishing in season. See Tolland State Forest for full description of park. Scenic paddling along the Charles River will take you to this reservation, where the Charles River makes a nearly 180-degree twist in the valley, a wooded shoreline of birch, hemlock, and beech conceals an upland peninsula that rises gently to a 20-acre open field, which has been farmed for more than a century. A narrow footpath tracks the river along the Reservation's shoreline, while the field's highest point offers views of the Charles River. Leominster State Forest is a 4,300-acre forest with two ponds. Easy drive from Worcester and Boston. Kayakers, canoeists, paddlers and fishermen enjoy Paradise Pond. Also, Crow Hill Pond is stocked with trout. From Memorial Day to Labor Day, parking fees are charged in the paved parking lots. Accessible only by boat, Bridge Island Meadows is surrounded by wetlands and thus a private favorite of intrepid paddlers. Kayakers can paddle on the Charles River, turning west into a stream that leads to South End Pond. Bolder paddlers can creep along Bogastow Brook to South End Pond. Landing is a challenge, as grasses grow tall and thick. A successful journey is rewarded by bushwhacking to a 130-foot tree-covered knoll at the south end of the reservation offering glimpses of the surrounding floodplain. Ashland State Park is located on the large Ashland Reservoir. Paddling in canoes and kayaks is allowed. The park has a boat ramp. There is wheelchair access to the beach, bathhouse, picnic and hiking trails. <B>Daily parking fee: </b>$8 for Massachusetts vehicle; $10 for out-of-state vehicle. The eleven ponds on the large, forested property are open to non-motorized boating, including canoeing and kayaking. No boat rentals. See full description of Harold Parker State Forest. This park revolves around a pond, where swimming, fishing and paddling is done. You must bring your own canoe or kayak; they are not available for rent here.